Barefoot Dream, home away from home, just steps from the beach has an Upper Level 2 bed 2 bath residence and a Beach Level 2 bed 2 bath residence. Each with their own private entrance they can be rented individually or together offering you a 4 bedroom and 4 bathroom home with a roof top deck. The Boat House, newly renovated and offering beach style luxury, you will feel pampered and at ease in this great beach house. The Boat House offers 2 residences in one building. The upper level owners suite 2 bedroom 2 bathroom and the ground level Beach Suite 2 bedroom 2 bathroom home. Casa Martin luxury private beach front rental on West Bay Beach. 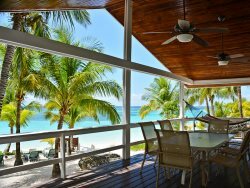 A true Caribbean beach house with sea views, vaulted ceilings, open plan living and private beach garden. The 2 bedroom 2 bathroom home offers the privacy of an upper unit along with stunning ocean views. Rooftop deck with private access, great for sunbathing or stargazing! Can be rented along with Satori Beach on the ground floor giving you 4 bedrooms and 4 bathrooms on the beach in West Bay. The quintessential 2 bedroom 2 bathroom Caribbean cottage, 100 paces from the water. Private and convenient, this location is unbeatable, close to the amenities of West Bay Beach yet secluded and private surrounded by lush tropical gardens. Just a moments stroll from bars and restaurants. Monkey La La, a classic 3 bedroom 2 bathroom private beach house with 1, 2 & 3 bedroom availability depending on your family/group size. The Upper level offers 2 bedrooms and 1 bathroom. The Studio can be rented along with the Upper level or separately. 2 bedroom 2 bathroom ground floor home with sea views, just 20 steps from the water. Satori Beach can be combined with Tortuga Beach House on the Upper floor giving you 4 bedrooms 4 bathrooms and a roof top deck. St Macs is a traditional stand alone Caribbean villa with loads of charm. 3 rental options available, the spacious luxury Upper unit with 3 bedrooms 2 bathrooms, the 1 bedroom 1 bathroom Beach Front Apartment or the Garden Apartment with 1 bedroom and 1 bathroom. Large group? Rent the whole house for a total of 5 bedrooms and 4 bathrooms, sleeping up to 10 persons. Enquire for availability & pricing. West Bay Delight is a 2-bedroom 2-bathroom beach level home in the heart of West Bay Village. A spacious screened deck provides comfortable inside outside living in this idyllic beach house.